You know what I always forget about? Seattle. I forget how close it is. I forget how beautiful it is on a sunny day. I forget how it has a big city vibe, but a northwest feel. I forget that the drive isn't bad at all, unless it happens to be foggy/rainy/dark/ or any other common weather pattern around these parts. But, fortunately, this weekend was one of the nicest fall weekends I can remember. So, I made my way up to Seattle. I left Saturday morning because I didn't want to drive in the dark and possibly the rain. (Does that make me sound old or what??) It was a nice drive. I listened to talk radio as I made my way up I-5. Finally, my other friend showed up and we ended up finding a little sushi place to grab a bite to eat during happy hour. It was called Dragon something and it was in the bottom of a hotel on Pike street. They had half rolls for $1.95 and $2.95. Not bad at all. We walked back to my friend's apartment, spent some time talking and having a glass of wine and then met up with other friends for dinner at The Cheesecake Factory. It was a nice meal. I had my favorite: Sweet Corn Tamale Cakes. It's actually an appetizer, but I always just eat it as a meal. There is plenty of food, believe me! But feeling up and awake for brunch at Julia's on Broadway and the drive home was well worth it for me. Happily, it was sunny again and the drive home wasn't bad at all. I did hit a traffic jam in Portland. It seems that an RV had turned over on its side on the bridge and everyone had to get off at the Rose Quarter exit and then get back on the freeway. The poor little old grandma and grandpa that were driving it were sitting forlornly on the median wrapped up in blankets, but at least they were alright. Thursday night in Salem. Ahhh. The amazing things we have to choose from. First of all, there was the Crystal Apple Awards for the school district. I chose not to go to that, but boy, oh, boy a lot of people chose to go. Salem was swimming in fancy clothes for once. :) People seemed to be taking the opportunity for a night on the town. The restaurants were full, and there was even what looked like a cocktail party going on in an empty storefront. Since everything was so packed we ended up waiting to have dinner until after our movie. We went to Jonathan's for their delicious chowder and realized that it seems to be smoke-free. I don't know when that happened, but it was a delightful surprise. 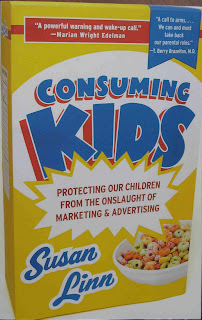 I decided to go to a showing of a documentary called "Consuming Kids" instead. It was showing at the Grand Theater as part of the Salem Progressive Film Series, which happens every second Tuesday of the month. What an amazingly interesting film. Depressing, but interesting. There was a short film before the main feature that I thought was almost, if not more, interesting. 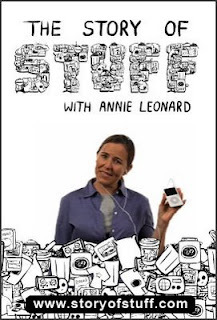 It wasn't that there was so much new information in "The Story of Stuff," but it was just so well put. It's a film I think everyone should see, just to be reminded. Sunday morning was one of those perfect fall mornings that is crisp and cool, a little blustery, but not too much. I had breakfast with a friend and we decided it was perfect weather to walk down to Busick Court for their Sunday brunch. First we put our names in on the list and found out that the wait was about 25 minutes. Since we had noticed that people were eating breakfast at Copperjohn's next door, we decided to stop in and see what they had on their menu. The problem was apparent the minute we walked in. It smelled like smoke. And that is not something I can stomach at 10:00 in the morning. I can deal with it in the evening, but not with my breakfast. Nevertheless, we looked at the menu, which was small, but looked delicious and reasonably priced. We asked about the smoking ban in January and found out that they are going to do a remodel to make sure the smoke smell doesn't linger. I might try their breakfast after that. Back to Busick for brunch. I had the Broadway Joe scramble with a biscuit and gravy. It was delicious all around and of course there was plenty to fill me up and even take home. They have very hearty portions. My friend got a Chicken Cordon Bleu meal, but was disappointed that the sausage and ham were just piled on top rather than stuffed in the chicken breast. The place was busy and seemed like it was a little understaffed. It took much longer than usual to get our coffee refilled. In fact, I only got refilled twice, when I normally drink 3-4 cups with a brunch meal. It started raining while we ate, but we made our way home through the drizzle and the leaves by walking almost the whole way under the eaves of different stores and buildings. It was a beautiful way to spend a drizzly fall morning.